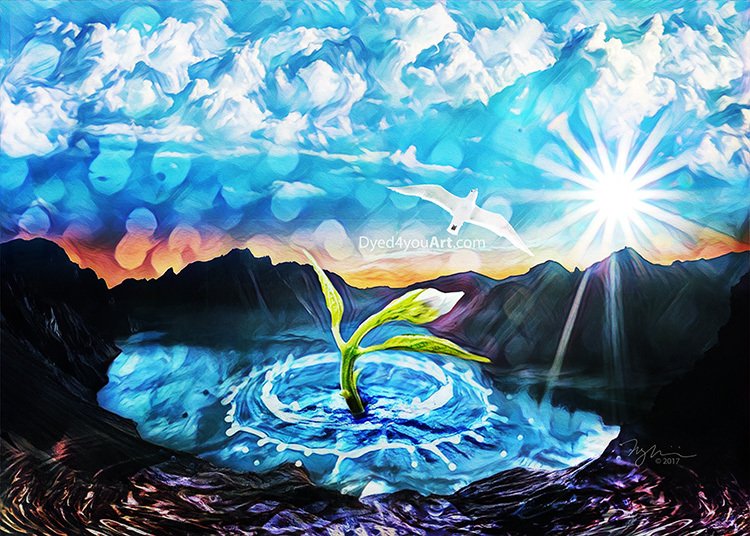 Sun of Righteousness depicts the fresh shoot having come through the dry, parched ground now saturated by the outpouring of His life-giving flow from heaven. Malachi 4:2 (VOICE) But for you, the ones who tremble at the sound of My name, a warm sun of righteousness will come forth with healing in its rays, and you will go out, springing from the stalls like calves in open pasture. Psalm 84:11 (TLB) For Jehovah God is our Light and our Protector. He gives us grace and glory. No good thing will he withhold from those who walk along his paths. Beloved, I AM the Life Giver. I AM YHVH Ori (the LORD your Light), your Rock and your Salvation. I AM the Alpha and Omega – the Beginning and the End. I AM the Foundation of your Life and the Creator of it. I AM. And you are My beloved. The precious one I hold dear. The apple of My eye and center of My world. My gaze forever rests on you and I cannot get enough, so great is My love for you. Isaiah 35:1-9 (VOICE) Imagine the wilderness whooping for joy, the desert’s unbridled happiness with its spring flowers. It will happen! The deserts will come alive with new growth budding and blooming, singing and celebrating with sheer delight. The glory of Lebanon’s cedars and the majesty of Carmel and Sharon will spill over to the deserts. The glory of the Eternal One will be on full display there, and they will revel in the majestic splendor of our God. Then, such healing, such repair: the eyes of the blind will be opened; the ears of the deaf will be clear. The lame will leap like deer excited; they will run and jump tirelessly and gracefully. The stutterer, the stammerer, and the tongue of the mute will sing out loud and clear in joyful song. Waters will pour through the deserts; streams will flow in godforsaken lands. Burning sands and hardened wastelands will become pools, shimmering with life; the thirsty ground will drink deep from refreshing springs. Abandoned villages where predators once lurked will become grassy playgrounds. Dry, arid land will turn lush and green. And the road to this happy renovation will be clearly signed. People will declare the way itself to be holy—the route, “sacred.” Only those who are right with God will be able to walk its pleasant path, And nobody—no visitor, no dimwit—will get lost along it. There’ll be no lions lying in wait, no predators or dangers in sight. Only those made right with God will journey there. You are My child – not a visitor or dimwit – My highway of holiness, stream of the supernatural, is a place you are fully welcome, beloved. Step in. Step up. Let My light and life rush over you. A “whisper” called “The light of My love” from the Passion Translation team’s “I Hear His Whisper” is connected to this. The shining of My love upon you is the Light that guides, warms, nourishes, and strengthens. Turn your heart to the Light of My love and I will pull the “weeds” from your garden that hinder our fruit from coming forth. When you turn to Me I will accomplish what all your strivings have not– I will change you from the inside out. I am patient and kind, and there is so much more compassion in My heart toward you than you have realized. You are not a disappointment to Me, but a delight! …Whenever you turn your focus to Me and set your gaze on things above, I am stirred to bring you into greater measures of My love and holiness. Let nothing silence your songs of praise, and let nothing stand in your way as you pursue the quest for even more of My love. 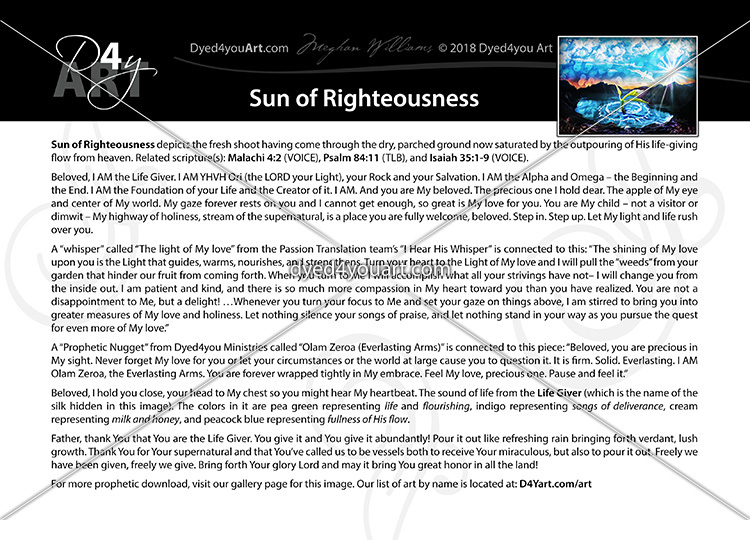 A “Prophetic Nugget” from Dyed4you Ministries called “Olam Zeroa (Everlasting Arms)” is connected to this piece. Beloved, I hold you close, your head to My chest so you might hear My heartbeat. The sound of life from the Life Giver. The name of the silk hidden in this image is Life Giver. 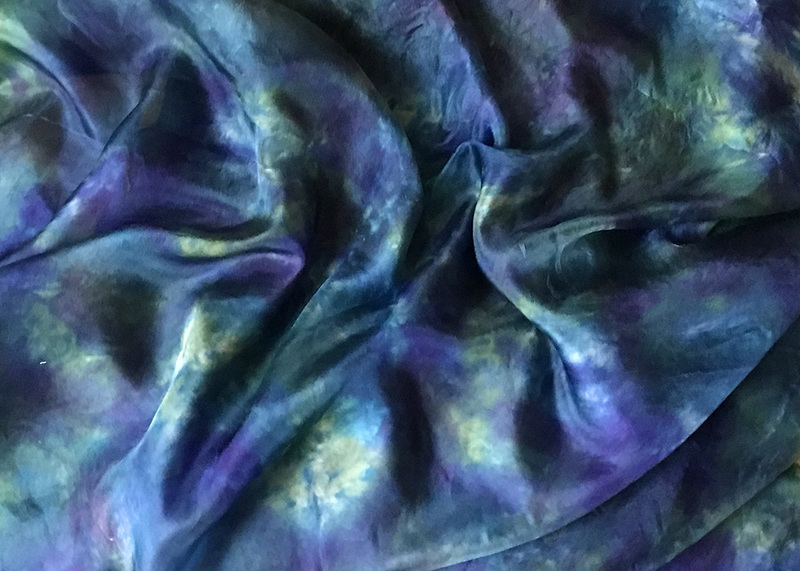 The colors in it are pea green representing life and flourishing, indigo representing songs of deliverance, cream representing milk and honey, and peacock blue representing fullness of His flow. Father, thank You that You are the Life Giver. You give it and You give it abundantly! Pour it out like refreshing rain bringing forth verdant, lush growth. Thank You for Your supernatural and that You’ve called us to be vessels both to receive Your miraculous, but also to pour it out. Freely we have been given, freely we give. Bring forth Your glory Lord and may it bring You great honor in all the land! Father, I’m hearing a drumbeat, which I’m realizing is the cadence of Your heart – everything MUST align with this beat, everything MUST align with Your sense of order. So Father I call into alignment every piece of life, every emotion, every thought… it all surrenders to Your plan and Your pace. Father, as I’m birthing this and as I’m praying it’s like I feel mud trying to slow me, I feel like that is representative of hindrances that are trying to throw things off Your cadence so again I command all things to align with the will of God! The sky is clear and the Spirit is moving – fresh flow, in time and on time – sparkling, fresh life COME FORTH! In Jesus’ name I pray and Father may it be done according to Your will. Amen.